The Under-Secretary-General and High Representative for Disarmament Affairs, Ms. Izumi Nakamitsu, helped introduce Japanese audiences to a landmark plan by the Secretary-General for the United Nations to put disarmament and non-proliferation at the centre of its work. 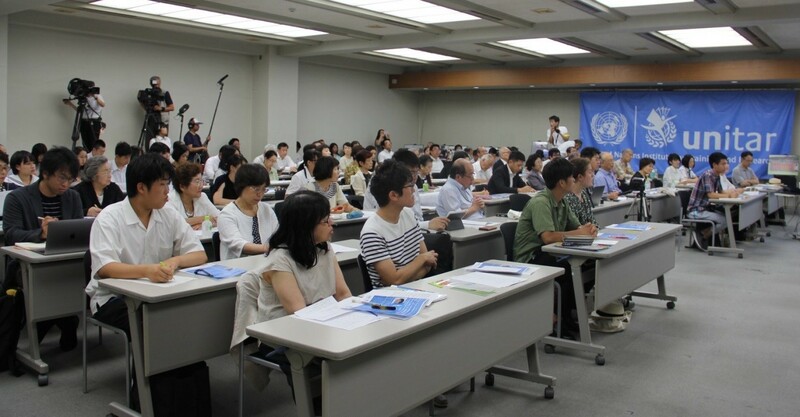 Ms. Nakamitsu discussed Secretary-General António Guterres’ new initiative, entitled “Securing Our Common Future: An Agenda for Disarmament”, in a panel discussion held in Hiroshima on 6 August 2018, the 73rd anniversary of the atomic bombing of the city. Speaking to about 140 people, including survivors of the atomic bombing, the High Representative said Secretary-General Guterres was the first holder of his office to pursue a disarmament initiative of such comprehensive scope. Secretary-General Guterres unveiled his Agenda on 24 May in a speech at the University of Geneva. Echoing the urgency he expressed then, Ms. Nakamitsu challenged the view that discussions about disarmament were of less value in a deteriorating international security environment. “We at the United Nations are seeing this issue from quite a different perspective. Because the world has become more dangerous, we must pursue disarmament more vigorously and place it at the center of the UN’s main priorities again,” she said. Her remarks were part of an event co-organized by the United Nations Institute for Training and Research (UNITAR) Hiroshima Office and the United Nations Office for Disarmament Affairs. 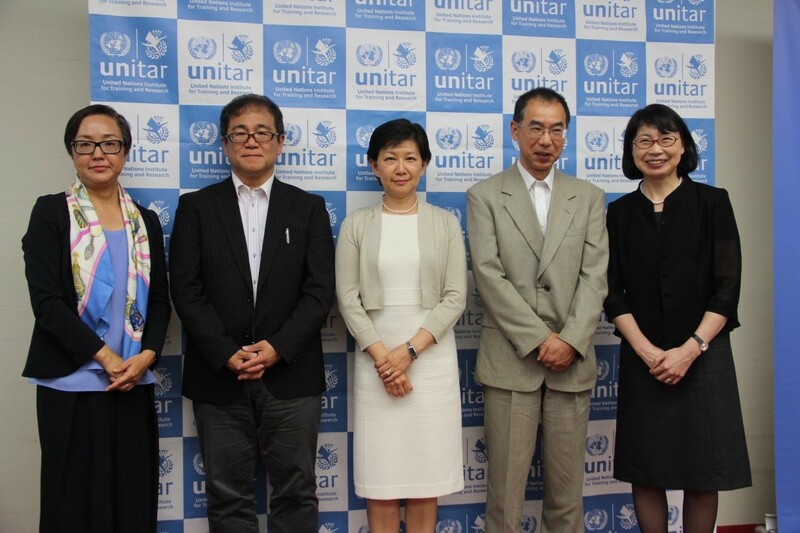 The gathering commemorated the 15th anniversary of the UNITAR Hiroshima Office and kicked off its new Ideas That Matter Series. 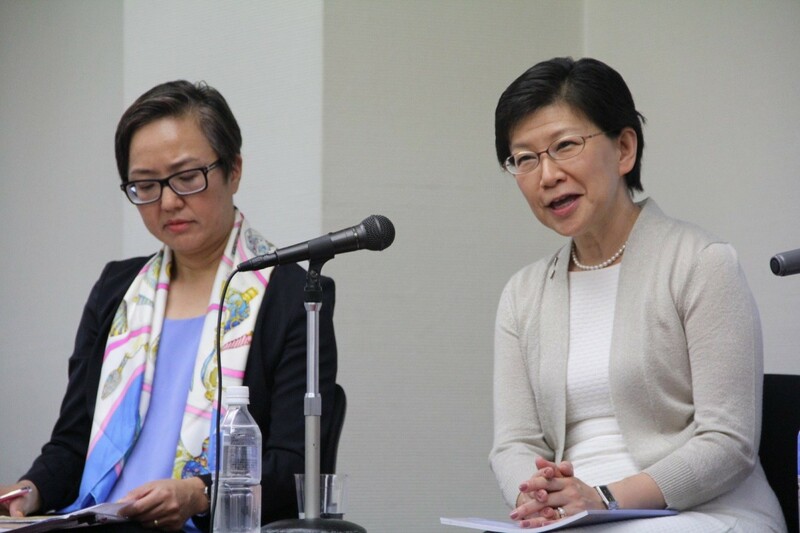 In an interactive panel discussion moderated by Ms. Mihoko Kumamoto, Director of the UNITAR Hiroshima Office, Ms. Nakamitsu explained three components of the Agenda that respectively address weapons of mass destruction, conventional weapons and so-called “frontier issues” such as cybersecurity and artificial intelligence (AI). She was joined in the discussion by three Japanese experts on peace and security: Professor Masahiko Asada of Kyoto University, Professor Yukie Osa of Rikkyo University and Professor Heigo Sato of Takushoku University. Speaking in reference to “Disarmament to Save Humanity”, the Agenda’s section on weapons of mass destruction, the High Representative said the Secretary-General would promote dialogue aimed at bridging divergent positions on nuclear disarmament. She also stressed the need for all Member States to reaffirm that nuclear weapons must not be used. Discussing related challenges, Professor Asada of Kyoto University said the United States and the Russian Federation were moving too slowly in their bilateral engagement on nuclear weapons, especially with regard to replacing or extending the Treaty on Measures for the Further Reduction and Limitation of Strategic Offensive Arms (New START), which was due to expire in 2021. He recalled that the Russian and United States presidents did not publicly discuss a possible extension of New START during a June summit, and he noted that their Governments had been questioning one another on matters related to compliance with the 1987 Treaty on the Elimination of Intermediate-Range and Shorter-Range Missiles (INF Treaty). Professor Asada also remarked that nuclear-weapon States and their allies would not join the Treaty on the Prohibition of Nuclear Weapons as long as they relied on nuclear deterrence. While acknowledging such concerns about the treaty, the High Representative noted that international norms against nuclear weapons are being strengthened and underlined the importance of taking forward nuclear disarmament through the use of varied tools in an effective and complementary manner. “Although Japan is not likely to sign the Treaty on the Prohibition of Nuclear Weapons for the time being, I encourage all of you to ask questions and deepen discussions about how to pursue nuclear disarmament”, she said. Turning to the matter of chemical weapons use in the Syrian Arab Republic, Professor Asada said the Government continued to use such weapons despite its 2013 accession to the Chemical Weapons Convention, which prohibits their development, production, possession and use. He said that although the situation demanded an urgent response, it remained difficult even to ascertain who had used chemical weapons due to the expiration in November 2017 of the mandate of the Organisation for the Prohibition of Chemical Weapons–United Nations Joint Investigative Mechanism. In this regard, Ms. Nakamitsu stressed the increasing complexity of intra-state and regional conflict generally. Referring specifically to the Syrian civil war, she noted how regional disputes and the involvement of major powers had limited the scope of agreed Security Council action. In a separate discussion of “Disarmament that Saves Lives”, the priorities of the Secretary-General’s Agenda related to conventional weapons, the High Representative noted that advancing disarmament in the field of conventional weapons could begin to save lives immediately. Echoing Ms. Nakamitsu, Professor Osa of Rikkyo University described the potential benefits of progress on conventional weapons, which include mines, tanks, warships, jet fighters, cannons, missiles and ammunition. Citing one example, she highlighted the devastating impact of landmines on refugees. “The Mine Ban Convention was concluded in 1997—although a number of countries have not joined it—and there is a global norm against the use of landmines,” she said. Professor Osa also highlighted a significant relationship between the emergence of child soldiers and the wide availability of small arms: because such weapons were small and light enough to be used by children, their proliferation had contributed to more children being forced into combat. Turning to “Disarmament for Future Generations”, the component of the Secretary-General’s Agenda addressing rapid progress in areas such as artificial intelligence (AI) and cyberspace, Ms. Nakamitsu warned that the potential abuse and weaponization of emerging technologies could have a tremendous impact on the international security environment. “To prevent this, we need to involve various actors in the private sector, engineers and scientists in discussions to consider new norms—not limited to formal ones such as treaties—that would ensure their substantial adherence through creative processes and methods”, she said. Professor Sato of Takushoku University said the unprecedented nature of frontier technologies would complicate any potential response with a disarmament or non-proliferation dimension. He added that AI and cybertechnology were potentially dangerous not as offensive weapons but as “enablers” of other weapons, and their increasing indispensability in everyday life would require management of their use or development prior to their emergence as threats in this regard. He expressed hope that, at a minimum, Governments would reach agreement on the need to place all weapons under human control to help prevent armaments supported by cyber technology or AI from making life-or-death decisions. To achieve progress in the Agenda’s three priority areas—weapons of mass destruction, conventional weapons and frontier technologies—High Representative Nakamitsu emphasized the importance of strengthening partnerships for disarmament, including by ensuring the equal, full and effective participation of women. “Women have played key roles in promoting disarmament in the past, but we intend to further advance their roles and create more opportunities for women.” She also stressed the importance of the role of young people: “The Secretary-General’s Disarmament Agenda says young people are the ultimate force of change”. Addressing the broader question of how individuals can support the work of disarmament, Ms. Nakamitsu noted a recent effort by private-sector AI researchers to discourage the militarization of technologies they had developed. “This is an interesting initiative and a good example in which researchers and employees in this field proactively tackled this issue as their own and influenced the company’s policy”, she said. Taking a longer perspective, Professor Asada pointed out the value of disarmament and non-proliferation education, which he said was a low priority in Japanese universities. He singled out the importance of providing a good understanding of disarmament and non-proliferation issues to future civil servants who could participate in disarmament negotiations. Professor Sato, for his part, said many universities suffered from a shortage of military and security expertise. “It is very dangerous to talk about disarmament and arms control without knowing what is discussed and pursued in the military and security area, and what kind logic and common understandings lie behind it”, he said. Professor Osa said the cultivation of greater cross-cultural empathy is important to countering what she called the “four enemies of humanity”: self-interest, lack of imagination, lack of awareness and indifference.